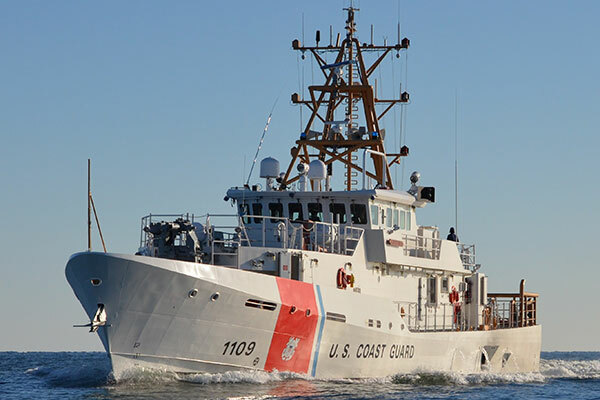 USCGC Kathleen Moore (WPC-1109), Don’t expect future WPCs to look much different. In October 2015 I reported that the Coast Guard would be getting a new gun mount, the Mk38 Mod3, and at that time it appeared that the gun would be substantially different from the Mk38 Mod2 that was being mounted on the Webber Class WPCs. DefenseMediaNetwork reports the Mk38 Mod3 offers a number of improvements over the Mod2 currently being fitted to the Webber class, including more ready ammunition on the mount (500 rounds vice 165), a coaxial .50 cal. gun (there was already a plan (pdf) to add a coaxial 7.62mm to the Mod2 version), higher elevation (75 degrees vice 40), better weather protection and serviceability, and the ability to simultaneously track up to three targets. There are also improvements to the search function of the ElectroOptic sensor that should make the system more useful in peacetime roles. They also report that BAE and Israeli manufacturer, Rafael, are considering adding the “Advanced Precision Kill Weapon System” APKWSII guided 70mm rocket system to the mount. In fact Israeli versions of this system already support surface to surface and surface to air missiles. It now appears the only improvements will be in the electro-optics and in fact the gun mount itself will be identical to the Mk38 Mod2. Slides from a NAVSEA presentation, in fact, list the Mk38 Mod2 gun mount as a component of the Mod3. A data sheet on the Mk38 Mod3 indicates there is an option to add a coaxial 7.62mm chain gun with up to 750 rounds on the mount, but otherwise the mount is identical to the existing Mod2 installations, e.g., no greater elevation limits, no more ammunition on the mount, as already anticipated, no 30mm gun, and nothing regarding adding APKWSII guided rockets to the mount. There is no indication yet that the Coast Guard intends to add the 7.62mm machinegun to the mount. Here is the BAE’s description of the system. “The Mk 38 MGS is a low cost, stabilized self-defense weapon system that dramatically improves ships’ self-defense capabilities in all weather conditions, day or night. Installed aboard 14 different classes of U.S. Navy ships and U.S. Coast Guard cutters, it is used extensively by the U.S. military as well as by NATO forces. “While the EO/IR sensor system is integrated with the Mod 3’s state-of-the-art fire control system, the Mk 38 Mod 3 is unique from other naval weapons because its surveillance system moves separately from the gun system, preventing adversaries from easily knowing they have been detected. I am disappointed that we will not see the additional improvements, but the improvements in the optics that make the system useful as more than a weapon system are certainly welcome. We still really need a system on our WPBs and WPCs capable of forcibly stopping medium to large merchant ships with an effective range of at least 4000 yards. This entry was posted in Uncategorized, Weapons by Chuck Hill. Bookmark the permalink. If the planned improvements had been implemented, including the 30mm gun, there would have been little to choose between the Mk38 and the Mk46 30mm gun system being installed on Navy LCSs and LPDs. This maintains a performance difference. Wonder if that is why these improvements were not implemented? The USN and USCG had better learn: Up-gun or be out-shot by your enemy!